Every company wants to put their sales on full power. But the unknown attribute of fickle customer preferences often throttle it. That's when predictive analysis comes into play, by making the unknown known. Many businesses ranging from retail to banking are using predictive analytics to increase sales and maximize their profits. As the name goes, predictive analytics involves making predictions based on concrete data, not gut feeling. So, how can you use predictive analytics to increase sales? Read on to learn more. Big data is useless if your business can’t leverage from it. Predictive analytics crunches the big data and turns it into smart actions. Data garnered from customer habits and interactions at touch points helps them to point their resources in the right direction. It helps you to utilize all the information that you have about your customers effectively, allowing you to know what your customers are likely to buy, why they are motivated to buy from you, and when they are most likely to make the purchases. 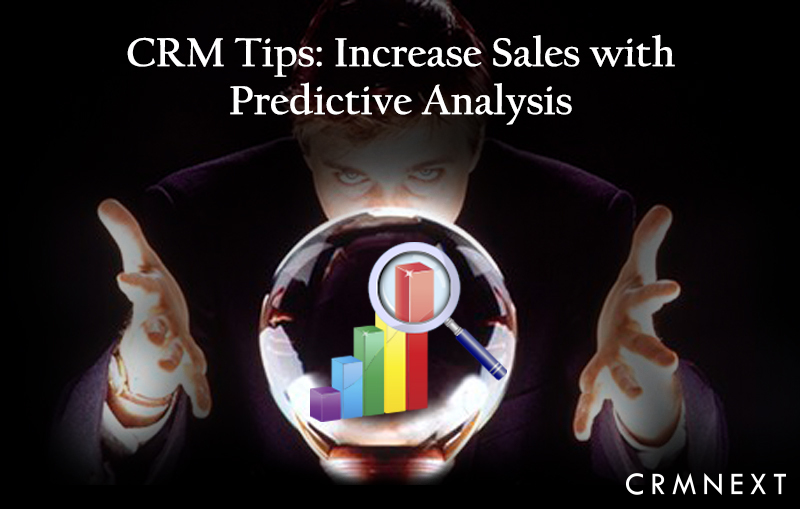 Predictive analytics within CRM solutions help you to predict trends and come up with marketing techniques that will help you to increase your sales. That means sales on a high speed lane instead of rough terrain. In addition, you will learn how your customers think and be able to understand them better. This will help you to not only improve the performance of your business, but also to make informed business decisions.This means that you can use predictive analytics to turn a prospect into a loyal customer. Once you know what your most loyal customers want and collect vital information on your prospects’ activities, easily predict the likelihood of these prospects to buy from you. Cross selling through CRM software has never been so easier. It is always wise to concentrate on leads that have a higher possibility of conversion. Calendar is one the most common time management function. But sadly, not commonly used for optimizing sales. It stands (often) for scheduling (boring) meetings with no tangible results. Smart calendars in CRM helps to change that by providing detailed actionables, plans for a day. Time planned is not etched in stone. Smart scheduling will take this into account by automatically adjusting revised times.This ensures that your reps will always make the best use of their time. Wrong leads assigned to wrong resources will only result in one outcome, failed conversions with increased overheads. A well allocated prospects will increase the chances of conversions. Pairing the right lead with the right executive will result into faster conversions with minimum costs. Stiff competition and tough economic conditions are pushing many businesses to come up with ways that they can use their data to increase sales without straining themselves. Predictive analytics allows businesses to target customers with laser accuracy, converting shoppers into into loyal customers.